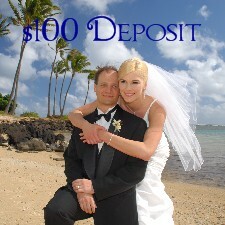 Please confirm your Wedding Reservation by sending your $100.00 Deposit within a week of making your reservation. Once your deposit arrives we will send you a receipt and place your Wedding on our CALENDAR. Please send your Wedding Deposit after you have reserved your flight to Hawaii and are sure you are ready to reserve your Wedding. Wedding deposits are non-refundable. Wedding payments & deposits are processed by PayPal. No account is necessary, couples without a PayPal account may select the credit card payment option: "Don't have a PayPal account? Pay with your Debit or Credit Card." You may also send a deposit of another amount or pay off your final balance here. All payments sent from this page will be applied to your balance due. If you prefer to pay by telephone, please call us at 808-924-3600 or schedule a meeting to pay in person. If you ordered a Wedding package with deluxe flowers over $100 or Dinner tickets, please send another deposit to cover those items one month before your Wedding. Please pay your final balance one week before your Wedding. 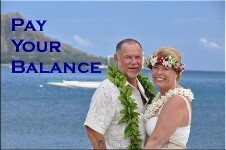 Beach Weddings on Oahu - Final payment is due 7 days before your Wedding date. For larger Wedding packages (over $1000.00), please pay your final balance one month before your Wedding. Full payment is due one month before your Wedding. Any balances unpaid by your Wedding day will be charged to the card we have on file. Please pay your balance due on time to avoid possible rescheduling of your Wedding. *For Weddings booked less than a month in advance, please authorize the full amount of your Wedding Package. Please contact us at any time if you have questions about your Wedding Reservation or need to make any changes. Thank you for the wonderful service you provided us for our wedding. Your company is very professional and affordable and I appreciate that you were flexible in our needs! Again, a big Mahalo for marrying us and providing us with a wonderful experience throughout the entire planning process!